Explanation: Saturn and its magnificent ring system can offer even casual astronomers the most memorable of telescopic sights. Wandering between Leo and Cancer this month, a bright Saturn is well placed for viewing in evening skies. But from our earthbound perspective, the tilt of Saturn's rings does change with time. 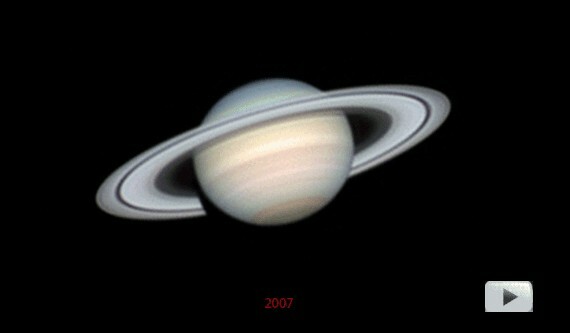 In 1995 and 1996 the broad rings were edge-on and nearly invisible, gradually opening to a spectacular maximum tilt of about 27 degrees by 2003. This frame from a series of Saturn images beginning a year later, in 2004, and ending just last month shows the steady decrease in apparent tilt as the rings head toward another edge-on presentation in 2009. Saturn's south pole is toward the bottom. Click on the picture to view the sharp, color gif movie.